Congenital abnormalities are among the leading causes of infant morbidity and mortality and fetal loss. The leading sites of congenital abnormalities are the skeleton, skin, and brain. Congenital abnormalities of the CNS can be divided into developmental malformations and disruptions. Developmental malformations result from flawed development of the brain. This may be caused by chromosomal abnormalities and single gene defects that alter the blueprint of the brain, or by imbalances of factors that control gene expression during development. Gene defects may be in the germline or may develop after conception by spontaneous somatic mutation or from the action of harmful physical or chemical agents. Some malformations are caused by multiple genetic and environmental factors acting in concert (multifactorial etiology). Disruptions result from destruction of the normally developed (or developing) brain and are caused by environmental or intrinsic factors such as fetal infection, exposure of the fetus to harmful chemicals, radiation, and fetal hypoxia. For instance, holoprosencephaly, a condition in which the forebrain is not divided into two hemispheres, is a malformation. Hydranencephaly, in which massive destruction reduces the hemispheres into fluid-filled sacs, is a disruption. The line between malformation and disruption is sometimes blurred because an extrinsic factor (e.g. radiation) may cause direct physical injury but also damage genes that are important for development. Developmental malformations are usually either midline or bilateral and symmetric and do not show gliosis. On the other hand, most disruptions are focal and asymmetric and are associated with gliosis and other reactive changes such as inflammation, phagocytosis, and calcification. However, these reactions may not be present if the disruption occurs in the first trimester, when the brain is immature. 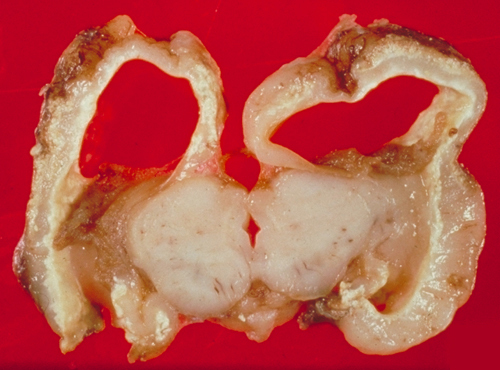 For these reasons, it is hard, sometimes, to distinguish malformation from disruption. This distinction carries important implications. Malformations carry a recurrence risk that can be calculated. Disruptions do not recur, unless the exposure recurs or continues. First trimester CMV infection. Microcephaly and abnormal gyral pattern. Coronal section of the brain on the left. Atrophic cortex, large ventricles, and periventricular calcifications. Exposure to teratogens, viral infections, etc., can occur throughout pregnancy. The timing of exposure is critical for both, malformations and disruptions. The earlier the exposure, the more severe the defect. For instance, fetal cytomegalovirus (CMV) infection before midgestation causes microcephaly and polymicrogyria. CMV infection in the third trimester causes an encephalitis, similar to postnatal CMV encephalitis. 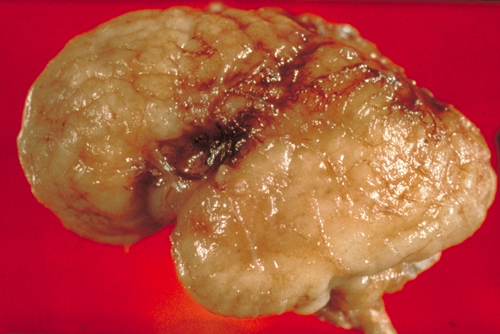 The most critical period for malformations and disruptions is the third to eighth week of gestation, during which the brain and most organs take form.